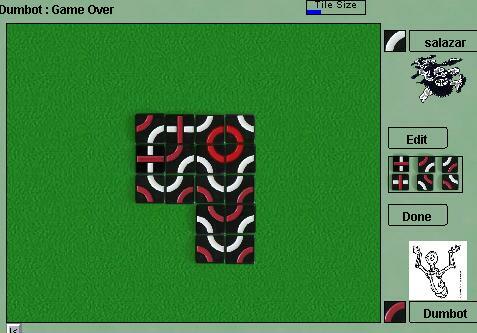 Trax is an elegant game played with one type of tile, which has a cross on one side and two quarter-circles on the other. The goal of the game is to form a closed loop in your color, or a line which extends eight spaces from margin to margin. Spaces where only one tile can fit are filled automatically. There are a few more conditions in the official rules, but that's really just about it. Trax is a fast, tactical game, where one player is almost always threatening an immediate win. Played by experts, pattern recognition seems to be more important than deep analysis. Robots: the robot players for Trax are pretty good, but still beatable. They're definitely good enough to teach you the game, but not good enough to use to practice for a serious tournament. The back story: Trax is a "help for my friends" project. I've been aware of Trax for a long time, and it gets many good mentions, but it never particularly grabbed me as a game. Then my friends at Tantrix decided to take over manufacturing and marketing it from their friend David Smith. How could I resist?